Uglyworld #756 - Secrets Of An Ugly Marine (249-365), originally uploaded by www.bazpics.com. 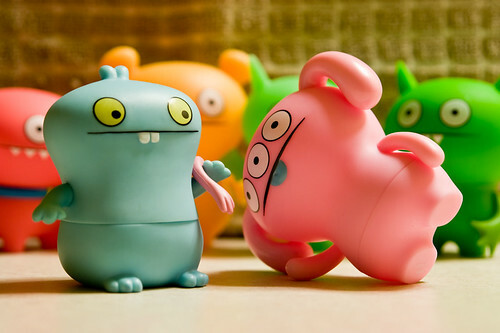 This evening Babo decided that it was time to put on a masterclass in self defence for everyone to watch and enjoy. "You musts all remembers that having to fights is never a goods thing, but whens you has no other options then is always goods to knows how to defends yourselfs", Babo explained before asking for someone to be the would-be assailant for his demonstration. Peaco was pushed forward towards Babo by Ice-Bat and Ralf who quickly retreated back to the safety of the back wall where Trunko and Poe stood excitedly. Babo gave everyone a quick overview of what he was about to demonstrate, "The arts of being ables to quickly disables an attacker is alls about surprises and believes me when I tells you this - there is no biggers surprises that when you can removes an arm that they didn't knows they hads!". Babo gestured to Peaco to come at him as quickly as he possibly could, Peaco was approaching almost like lightning yet Babo was able to quickly side-step, grab the "non-existent" arm and pluck it away from Peaco who tumbled to the floor in astonishment. Peaco stared towards the pink arm Babo was holding tightly in his grasp, partially amazed at the fact firstly that Babo was able to move so fast, and secondly coupled with his thoughts of where the hell the arm had come from in the first place. Babo's first lesson went down a treat with everyone else who whooped and cheered with excitement as Babo helped Peaco back to his feet.